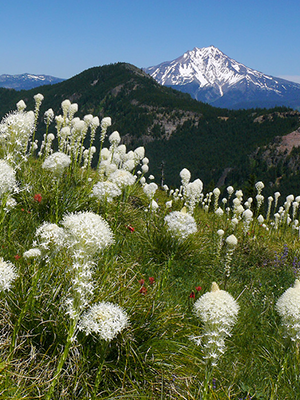 Beargrass grows in Oregon's Cascade Range. OregonFlora provides a digital library of information about Oregon's botanical life. Photo by Tanya Harvey. OregonFlora provides a vast digital library of information about plants in Oregon that grow without human or machine cultivation. At Oregon State University – Cascades’ next Science Pub, OregonFlora director and OSU botanist Linda Hardison will present “What Plants Grow Here?,” a survey of our state’s botanical life. The Science Pub will take place on September 18 in Father Luke’s Room at McMenamins Old St. Francis in Bend. Hardison, an assistant professor and senior researcher of botany and plant pathology in OSU’s College of Agricultural Science, has led OregonFlora, founded as the Oregon Flora Project, for more than a decade. OregonFlora reflects the work of scientists, students and volunteers undertaken over a quarter century as they surveyed plant life in Oregon. Hardison’s presentation will include an overview of how scientists and generalists use OregonFlora to learn about Oregon’s plants via its books, plant identification app and website that features interactive mapping, a photo gallery and a checklist of scientific names. Hardison earned undergraduate degrees in botany and marine biology from the University of Texas at Austin, and a Ph.D. in botany from the University of Washington. OSU-Cascades Science Pubs engage community members in the work underway by Oregon State University researchers and scholars. Science Pubs take place from 5:30 p.m. to 7:30 p.m. Networking, and food and beverage service begin at 5:30 p.m., and the presentation starts at 6:30 p.m. Science Pubs are free to community members, but reservations are required. Space is limited to 100 guests. Register by 5 p.m. the day prior to each Science Pub at osucascades.edu/sciencepubs.